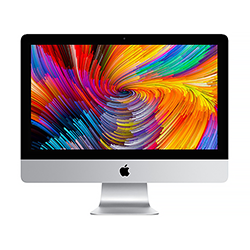 iMac performance is at an all-time high with faster Intel Core processors, powerful Radeon Pro 500-series graphics, Thunderbolt 3 (USB-C) connectivity, and stunning Retina 4K and 5K displays that shine 43 percent brighter and support one billion colors. Every Mac comes with a one-year limited warranty and 90 days of telephone technical support. The AppleCare+ Connect Protection Plan for Mac extends your coverage to three years from the original purchase date of your Mac. For extended coverage, AppleCare+ Connect must be purchased at the time of iMac purchase or from Apple within 12 months of your eligible iMac purchase. Electronic Waste Recycling Fee: The state of California requires a $6 recycling fee for electronic displays equal to or greater than 15 inches and less than 35 inches. This fee is paid to the state of California and is not retained by the SDSU Bookstore. This fee will be automatically added to your hardware purchase. Please note: With the purchase of an Applecare+ Connect Protection Plan, the SDSU Bookstore will enroll your product upon order fulfillment. Once completed, you will receive an email directly from Apple. No further action is required on your part. A signature confirmation will be required upon delivery. Hardware orders can only be shipped within the contiguous United States.